Allllll righty then. Let's get to it. As Ace Ventura: Pet Detective, Jim Carrey instantly soared to stardom while tearing decorum to pieces. The award-winning actor plays the screwloose sleuth determined to sniff out the Miami Dolphins' missing mascot and quarterback Dan Marino. Jim Carrey returns in Ace Ventura: When Nature Calls as the alligator-wrasslin,' elephant-calling, monkeyshining, loogie-launching, burning coals-crossing, disguise-mastering pet detective. Includes a bonus DVD with specially selected cartoons from the hit TV show Ace Ventura: The Animated Series. The bonus DVD includes the animated episodes "The Rein-Deer Hunter", "Natural Born Koalas" and "Dragon Guy". Available Only as Part of “Ace Ventura Deluxe Double Feature”. When one examines the film career of Jim Carrey, here’s where it all began. No, 1994’s Ace Ventura Pet Detective wasn’t his first film, and it’s not where he made a name for himself. Carrey’d made a few flicks prior to Pet, and he became famous for his work on In Living Color. Pet allowed Carrey to become a movie star, though. It came out in early 1994 and was the first salvo in his breakout year. The Mask followed in the summer while Dumber and Dumber appeared that winter. Each one earned more than the last and established Carrey as the serious box office draw he remains more than 12 years later. Who ever thought the guy best known for In Living Color’s grotesque Fire Marshall Bill would become such a star? Certainly no one who saw Pet. I don’t think even folks who liked the flick could predict Carrey’d take off the way he did. I sure didn’t feel that way, and I don’t even think I saw Pet theatrically. 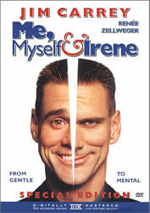 The film introduces us to the titular character played by Carrey. Based in Miami, he gets a big case when someone steals Snowflake, the football team’s dolphin mascot. With only two weeks to go before the Dolphins play in the Super Bowl, team assistant Melissa Robinson (Courtney Cox) hires Ace and works along with him. The movie follows the investigation and all the goofiness that goes along with it. For better or for worse, Pet did a lot to stereotype Carrey’s performing style. In truth, it really wasn’t all that representative of his work. Sure, he tends to go with broad comedy, but rarely has he taken off to such extremes as during Pet. As I noted earlier, I don’t think I saw Pet on the big screen, but that doesn't mean I didn’t develop an opinion of it. Based on clips I saw, I figured the film offered little more than more of the over the top idiocy Carrey pursued on In Living Color. 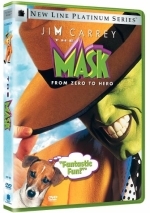 The Mask showed me that Carrey had more to him than just wild mugging, and I eventually came to be a fan of his work. Pet, however, reminds me why I disliked Carrey in the first place. The film accentuates all of his annoying traits but not many of his positives. As Ace, Carrey creates a tremendously irritating performance. His wacky antics grate from minute one and never allow the character to become anything other than a manic annoyance. This surprised me. Like I mentioned, I’ve come to enjoy Carrey’s work over the years, so I thought that hindsight would allow me to find value in his Pet performance. Instead, my current interest in his material may have formed the opposite reaction. Rather than gain appreciation for a performance I may have rejected in a knee-jerk way, I could more fully detect how obnoxious Carrey was in the part. His manic mugging was an extreme turnoff that negated any positives the film otherwise might boast. And believe it or not, Pet had potential. It features a delightfully quirky premise and goes with a light tone that could make it a fun comedy/detective combination. There’s nothing about the project that doomed it from the start. The talent undercut it, unfortunately. In addition to Carrey’s dreadful performance, directorial hack Tom Shadyac ruins things from behind the camera. He’s made his name working with manic comedic actors; in addition to hit pairings with Carrey here as well as in Liar Liar and Bruce Almighty, Shadyac directed Robin Williams in the saccharine Patch Adams. Liar succeeded despite Shadyac’s heavy hand, but the director dragged down the others and made them less effective than they should have been. Shadyac does the same here. Pet comes with a surprisingly Eighties vibe. I know it was made in the Nineties, but it feels like they shot it in 1986 and just didn’t release it until eight years later. This style seems especially noticeable via the movie’s music. The score goes with a cheesy blend of light Eighties hair metal and synth nonsense that feels like outtakes from the Beverly Hills Cop soundtrack. None of this helps the film, as the music actively detracts from any potential success it may otherwise boast. Frankly, I felt shocked by how much I disliked Ace Ventura Pet Detective. It relies way too much on Jim Carrey’s extreme mugging and doesn’t bother to attempt much else. The movie consistently irritates and produces painfully few laughs along the way. 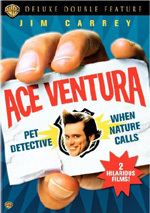 Ace Ventura Pet Detective appears in an aspect ratio of approximately 1.85:1 on this single-sided, double-layered DVD; the image has been enhanced for 16X9 televisions. This marked the film’s first widescreen presentation on DVD, and it looked mighty darn good. Only a few minor issues affected sharpness. Some shots came across as slightly ill-defined, though those cropped up infrequently. The majority of the movie demonstrated solid clarity and delineation. I noticed no jagged edges or shimmering, though some edge haloes appeared at times. Source flaws were surprisingly minor. In fact, other than a little grain, this was a really clean transfer. Colors came across well. The movie used a vivid, varied palette and always demonstrated tones that were quite attractive. The hues seemed lively and full. Blacks also appeared rich and dense, while low-light shots displayed good definition and visibility. Overall, this ended up as a more than satisfying picture. Imagine my surprise when I saw that Detective included a DTS 5.1 soundtrack along with the expected Dolby Digital 5.1 mix. Not that I heard any significant differences between the pair. The DTS version was louder, but otherwise the two mixes demonstrated similar characteristics. That became unfortunate since neither sounded very good. Problems affected both soundfield and quality. In the latter domain, a mix of concerns appeared. Speech tended to be reedy and edgy at times. The lines stayed intelligible but they lacked the expected clarity. Music was loose and boomy, and both songs and score also suffered from some high-end distortion. Effects fell into line with those elements, as they tended to be somewhat rough. None of these problems were extreme, but they meant the track lacked the quality I expected from a fairly modern movie. Nothing about the soundfield improved on these issues. The track tended to be broad but lacked definition. Music floated across the front and rarely demonstrated anything better than vague stereo imaging. No distinctiveness greeted the songs and score; they just seemed blobby. Speech remained appropriately localized in the center, but effects also failed to display appropriate placement. Like the music, those elements blended across the speakers in a mushy manner. Rarely did the pieces materialize in logical spots. Instead, they blurred together to become loose and evasive. This spread to the surrounds as well. They added crude reinforcement of the different elements but just made the whole thing even muddier. The audio was good enough to avoid falling to “D” levels, but I still felt displeased with the rough sound. For this new edition of Pet Detective, we get a few extras. The main attraction comes from an audio commentary with director Tom Shadyac. He offers a running, screen-specific chat. Originally recorded in 1997 for a laserdisc, Shadyac covers many useful topics. He discusses the project’s path to the screen and rewrites, adapting matters for Carrey and elements of the actor’s performance. Shadyac also goes into casting and other actors considered for Ace, tone and pacing, editing and cut sequences, sets and locations, working with animals, his lack of technical expertise, and the movie’s effect on his career. Shadyac rarely stops for air as he gives us a solid look at the flick. He keeps things interesting and entertaining while he also manages to provide good notes about the production. Shadyac remains enthusiastic but never becomes gushing or annoyingly full of praise. I don’t think a lot about the movie, but I like this strong commentary. In addition to the film’s trailer, we get three vintage TV spots. None of these are terribly interesting. Since this edition of Pet can be bought only as part of a three-disc “Ace Ventura Deluxe Double Feature”, I thought I should mention the third platter as part of my review here as well as with the original movie. That DVD includes three episodes of an animated Ace series that aired in the mid-Nineties. We find “The Reindeer Hunter”, “Natural Born Koalas”, and “Dragon Guy”. These are a little edgier than the typical Saturday morning fare, and Michael Hall does a decent impression of Jim Carrey. (None of the original voice cast appears here.) The shows aren’t great, but they’re no worse than the source material. Live-action Ace is already cartoony, so he transitions fine to animation. I wasn’t particularly entertained by the shows, but they were watchable. Ace Ventura Pet Detective established Jim Carrey as a movie star. In retrospect, I can’t figure out why, as it presents him in the most obnoxious light possible. The flick generates the occasional laugh but annoys much more than it entertains. Audio quality is somewhat problematic, but the movie looks great, and a strong audio commentary highlights the package. Fans will be pretty happy with this “Ace Ventura Deluxe Double Feature”, as it includes both Ace movies along with some decent supplements at a bargain price. I can’t recommend this grating flick to non-fans, though.